On Tuesday the 10th December 2013, Environment Minister Greg Hunt approved the dredging and dumping of 3 million cubic metres of seabed in the Great Barrier Reef World Heritage Area at Abbot Point. However the Great Barrier Reef Marine Park Authority (GBRMPA) is yet to issue a permit to allow the dumping to occur in the Marine Park. They have said they will make a decision within ten days. 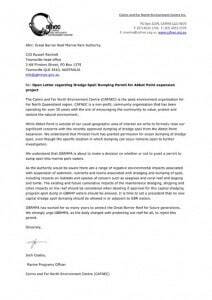 The following is our Open Letter to GBRMPA re Abbot Point dredge spoil asking that this permit not be issued. The Cairns and Far North Environment Centre (CAFNEC) is the peak environment organisation for Far North Queensland region. CAFNEC is a non-profit, community organisation that has been operating for over 30 years with the aim of encouraging the community to value, protect and restore the natural environment. While Abbot Point is outside of our usual geographic area of interest we write to formally raise our significant concerns with the recently approved dumping of dredge spoil from the Abbot Point expansion. We understand that Minister Hunt has granted permission for ocean dumping of dredge spoil, even though the specific location in which dumping can occur remains open to further investigation. We understand that GBRMPA is about to make a decision on whether or not to grant a permit to dump spoil into marine park waters. As the Authority would be aware there are a range of negative environmental impacts associated with suspension of sediment, nutrients and toxins associated with dredging and dumping of spoil, including impacts on habitats and species of concern such as seagrass and coral reef and dugong and turtle. The existing and future cumulative impacts of the maintenance dredging, shipping and other impacts on the reef should be considered when deciding if approval for this capital dredging program spoil dump in GBRMP waters should be allowed. It is time to set a precedent that no new capital dredge spoil dumping should be allowed in or adjacent to GBR waters. GBRMPA has worked for so many years to protect the Great Barrier Reef for future generations. We strongly urge GBRMPA, as the body charged with protecting our reef for all, to reject this permit.